CloneMaster will clean your hard drive of duplicate files that are just wasting space. 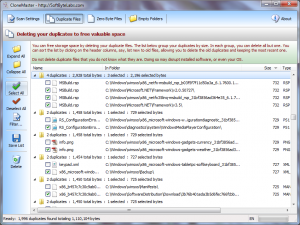 It searches for TRUE duplicate files (byte for byte) and bring them to your attention. CloneMaster can locate all files with identical content regardless of filename, date, time, or location. CloneMaster let you find duplicates in multiple paths, backups drive, drives (Hard drive, Floppy, USB Stick, Jaz, ZIP, CDROM, DVD, Network drives, etc.). 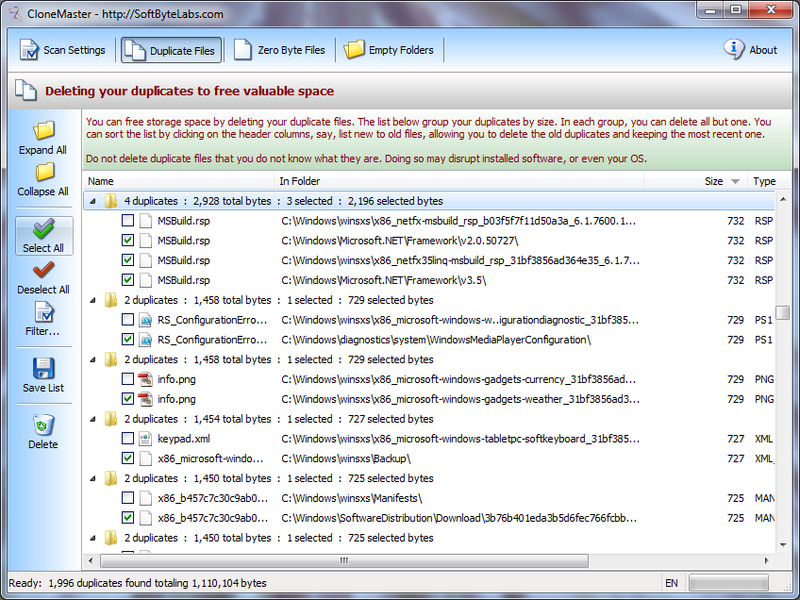 View of duplicate files: All of the duplicate files are listed in a single list to quickly select those to delete. Using the header sort, you can easily select the old duplicates to delete. Not only can CloneMaster find duplicate files, but it also find zero length file (empty files) and empty folders. System Context Menu: The system context menu (using the right mouse click) allow you to preview files, view the properties, delete etc. Print Duplicates: CloneMaster has the ability to Print the expanded list of duplicates by clicking on the Save List button, it will save your List of the duplicates into a .txt or HTML format, and then you can print the whole list. Byte for Byte: CloneMaster does not find duplicates by filename, date, size or CRC. 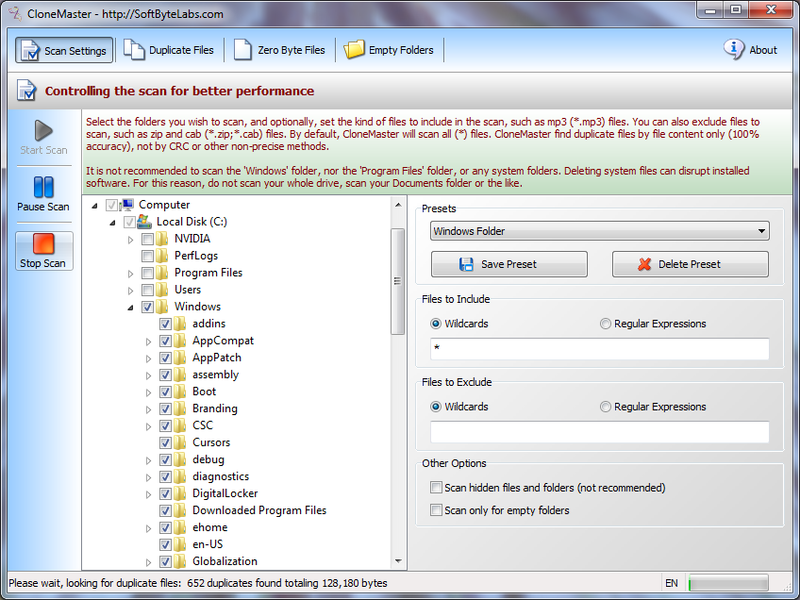 It does so by comparing the file data itself ensuring 100% accuracy. You might say this would take a long time right? CloneMaster uses a special algorithm that makes the scan extremely fast. It is as fast as your drives can deliver. No limites: CloneMaster can scan files with size over 2GB. 32bit is something of the past, CloneMaster handles 64bit file size. you can have as many duplicates listed, no need to wait for the list to update. Multi-language (UNICODE) interface: You can run CloneMaster in multi-language interface, all dialog texts and messages. Create your own language by editing the language file directly. Shareware license: Unlimited free trial. Mass delete only available in paid version.